St. Petersburg Department of V.A. Steklov Mathematical Institute and Euler International Mathematical Institute of the Russian Academy of Sciences. St. Petersburg Department of V.A. Steklov Mathematical Institute (PDMI RAS) was established in 1940 after the Institute had moved to Moscow. At present, despite the word "department" in its name kept due to historical traditions, PDMI RAS is an independent institute within the Russian Academy of Sciences. From 1976 till 2000 the Institute was headed by a prominent Russian scientist, mathematician and physicist, Academician Ludwig D.Faddeev. He established in St.Petersburg a new institute of Russian Academy of Sciences, Euler International Mathematical Institute (EIMI). Since January 1996 Euler International Mathematical Institute is contained in PDMI as a department. From 2000 till 2006 the Institute was headed by a prominent Russian scientist Academician Ildar A. Ibragimov. Fundamental research in pure mathematics and mathematical models of theoretical physics: mathematical logic and the theory of algorithms, algebra, number theory, geometry and topology, mathematical analysis, probability theory and mathematical statistics, mathematical problems of continuum mechanics, quantum physics, geophysics, and seismology. Creation and development of new methods for studying metric properties of geometric figures which led to the solution of classic problems of geometry of surfaces (A.D.Alexandrov and his pupils). Application of functional analysis methods to the problems of numerical mathematics, development of a general theory of approximative methods, new effective methods of solution operator equations (L.V.Kantorovich). Creation of the theory and methods for solving extremal problems with restraints (linear programming methods, in particular) and their application to the problems of economics (L.V. Kantorovich). The solution of the 19th and 20th Hilbert problems and the construction of the attractor theory of nonlinear evolutionary semigroups (O.A.Ladyzhenskaya). New methods in analytic number theory (large sieve, dispersion method) and solutions of a series of classic number theoretic problems (Yu.V.Linnik). The theory of summation of random variables (Yu.V.Linnik, I.A.Ibragimov). New methods and results in algorithm theory and constructive mathematics (proof of unsolvability of problem of homeomorphism, the notion of normal algorithm) (A.A.Markov). The solution of 10th Hilbert problem (Yu.V.Matiyasevich). Homologies in group theory, numerical methods in linear algebra (D.K.Faddeev). The complete solution of the quantum problem of three and more particles and the multidimensional inverse problem of scattering theory (L.D.Faddeev). The quantum inverse scattering method (L.D.Faddeev and his pupils). Correct rules of quantization of Yang-Mills fields (V.N.Popov, L.D.Faddeev). Theory of zeta-functions of multidimensional modular forms (A.N.Andrianov). Creation and development of ray method of implementation of wave fields (V.M.Babich). Investigation of integral representations of functions specified for regions and imbedding theorems (V.P.Il'in). Many scientists of the Institute were granted high prestige scientific awards of the USSR and Russia: Lenin and State Prizes, special awards instituted in commemoration of the great Russian scholars. Academician L.V. Kantorovich was awarded the Nobel Prize in Economics in 1975. The computation of motivic cohomology of weight 2 is completed, and the Quillen-Lichtenbaum conjecture on K-theory with finite coefficients for complex varieties of dimension no greater than 2 is proved (A.A.Suslin). The theory of cubic metaplectic forms on linear algebraic groups of range 1 and 2 is developed (N.N.Proskurin). New profound results are obtained in the classical problem of number theory concerning the asymptotics of the number of points of a lattice in an expanding domain and it is proved that in any dimension there are domains and lattices with logarithmically small remainders in the asymptotic formula for the number of points of a lattice in a domain (M.M.Skriganov). New investigation methods of sums of dependent random variables are developed (M.I.Gordin). The infrared parameterisation of Yang-Mills field is proposed (L.D.Faddeev). The methods of calculation of correlation functions in the integrable models of quantum field theory and statistical mechanics are developed (A.G.Izergin, N.M.Bogoliubov). New methods of asymptotic study of nonparametric estimation problems in mathematical statistics have been developed (I.A.Ibragimov). Organizing international scientific cooperation and creating conditions for joint research of Russian and foreign scientists, in the first place, mathematicians, are the main problems of Euler International Mathematical Institute that became a department of PDMI in 1996. 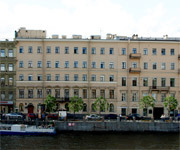 EIMI is located in a separate building at 10 Pesochnaya naberezhnaya, appropriately equipped for conferences numbering up to a hundred persons and for individual work of mathematicians coming to St.Petersburg. EIMI has a network of computers with Internet connection. Every year EIMI organizes about 10 international working meetings and conferences. It also conducts a long-term program of scientific cooperation "Tete-a-tete in Russia", whose aim is to organize meetings of Russian and foreign scientists for joint work in St. Petersburg. Moreover, for many years PDMI has been collaborating with Max Plank Institute (Germany), the University Paris-7, Lund University (Sweden), the University of Florence (Italy) and some other scientific centres. Yu.V. Matiyasevich has been awarded by the Alexander von Humboldt Foundation Award. A.Yu.Zaitsev, A.Kitaev, A.Bytsko are the Alexander von Humboldt Foundation fellows. K.Zainullin have been awarded an EPDI two-year grant. I.A.Ibragimov, A.N.Borodin, A.Yu.Zaitsev, M.I.Gordin have RFBR-DFG Grant 99-01--04027 and INTAS grant 99-01317; Maksim Skriganov has INTAS Grant 00-429; I.A.Panin, S.A.Yagunov i K.V.Zainullin have an INTAS grant; V.Kamotskii: INTAS Young Scientists Fellowship, YSF 01-198; E.A.Hirsch: INTAS Young Scientists Fellowship YSF 99-4044; Laboratory of mathematical logics: INTAS 447 "Weak Arithmetics". K.Dyakonov have been awarded a prize from Academia Europaea for young scientists from the CIS republics. PDMI is the founder and publisher of the notes of scientific seminars "Zapiski Nauchnykh Seminarov POMI RAN" (English version - "Journal of Mathematical Sciences") and the preprints of PDMI RAS. In addition, the editorial staff of the journal "Algebra i Analiz" (English version - "St. Petersburg Mathematical Journal") is located in the building of PDMI. English translations of these two journals are published abroad. Electronic versions of PDMI preprints are available in Internet at the www-server of the Institute. The library of PDMI is the leading mathematical library in St. Petersburg. All best mathematicians of St. Petersburg have a possibility to use the books and journals of the library of PDMI. Unfortunately, due to the financial situation in Russia, the library has no possibility to buy new books and journals which are extremely necessary for mathematical work. At this moment the library has 176396 books and journals. Among them 109764 are published in foreign languages (English, French, German...). The library is a part of the library of the Academy of Sciences and has no own budget. The books and journal are arriving from the central library and as donations of different organizations and persons. In the last years the amount of donations is about 50% of the whole amount of new books and journals. The new monographs in English are all donations.